Keeled ram's horn snail (Planorbis carinatus). Systematics of Gastropoda: Informal Group Pulmonata: Planorbidae. Ram's horn snail (Planorbarius corneus) - a right handed snail? 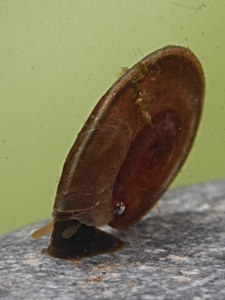 Ram's horn snails usually have shells formed like a disc or a plate, but there are also conical and cup-shaped species, for example the river limpet Ancylus fluviatilis. The disc-shaped shell of a ram's horn snail usually is tilted to the left, so the snail can carry it. So it appears, as if ram's horn snails were coiled to the right. The fact that genital opening as well as respiratory opening are on the left, shows that ram's horn snails indeed are sinistral (coiled to the left), the same as bladder snails (Physidae). Ram's horn snail egg batches are flat and disc shaped, they are usually placed on water plants. There are quite many species of ram's horn snails distributed worldwide. Among the native species there are also some introduced by aquarium owners, such as the American ram's horn snail (Planorbella duryi, see below). Other American species, such as the Colombian ram's horn snail (Marisa cornuarietis) are not ram's horn snails at all. They have an operculum and are related to apple snails (Ampullariidae) and mud snails (Viviparus contectus). There are species among the ram's horn snails using the blood pigment haemoglobin; this is exceptional among molluscs, which usually have haemocyanin instead, containing copper instead of iron. From outside, the shells of many ram's horn snails resemble those of fossil ammonites. But those are cephalopods (Cephalopoda), which means they are no more closely related than both being molluscs. Besides, there is a clear asymmetry in ram's horn snail bodies, as is characteristic for snails (Gastropoda). Ram's horn snails and river limpets were named at the same time in 1815 by Rafinesque (Planorbidae, and Ancylidae). When, in more modern time, it had been proven that both groups belong to one and the same family, for historic and for didactic reasons it has been decided to take over the name Planorbidae for all of them in the sense of Gray (1840). Mollbase: Ram's horn snails (Planorbidae). Little whirlpool ram's horn snails (Anisus vorticulus). Picture: © Ira Richling. Source: Mollusc of the Year. Another ram's horn snail, the little whirlpool ram's horn snail (Anisus vorticulus), has been elected German mollusc of the year 2011. Dimensions: W: 4 - 5 mm, rarely 8 mm; H: 0.5 - 0.8 mm; N: 5 - 5½. The little whirlpool ram's horn snail has a horn brown shell with a slightly concave upper side. 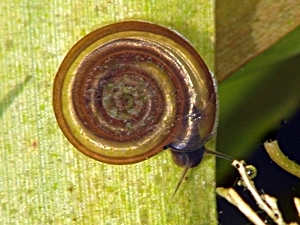 The whorls are clearly separated by a suture, the terminal whorl shows a blunt edge in the middle of the whorl's periphery. The aperture is elliptic and usually oblique. Like some other ram's horn snail species, Anisus vorticulus, too, has haemoglobin and red blood, but it hardly shines through due to the grey-black colour of the body. Little whirlpool ram's horn snail (Anisus vorticulus). Picture: © Ira Richling. Source: Natura 2000 RLP. 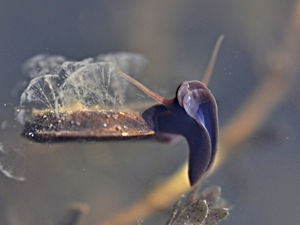 This snail's habitat are constantly clean water bodies with a rich content of oxygen and calcium carbonate. Anisus vorticulus is quite susceptible to eutrophication, neither does it live in places with fast water currents. 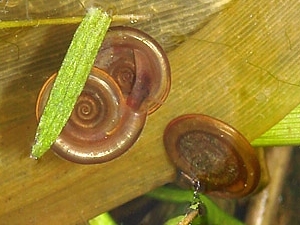 Usually the snails are found where vegetation of duckweed (Lemna trisulca), Hydrocharis and hornworts (Ceratophyllum) are abundant. 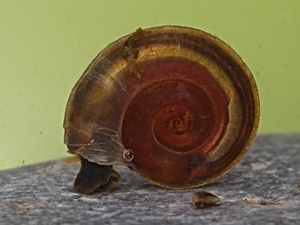 Compared to its shell, the snail's foot is very small. 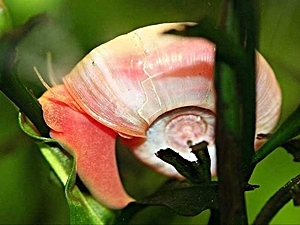 So, also because the shell is so flat, the little whirlpool ram's horn snail is able to squeeze in between water plants. On the search for food - Anisus vorticulus lives on algae it scrapes off water plants - it will also crawl ("float") on the water surface's underside. The little whirlpool ram's horn snail is quite rare and occurs in a discontinuous manner between England and Western Siberia, living in waters with suitable ecological conditions. In England, the present populations are severely threatened by eutrophication, and in Germany the species is also threatened by extinction, because the number of alluvial waters and backwater arms left to nature is in constant decline. Anisus vorticulus does occur in suitable alluvial waters of the rivers Elbe, Rhine and Danube, as well as in some lakes and swamp areas in Northern Germany. Apart from an oversupply of nutrients and a shortage of oxygen caused by eutrophication the main dangers to the little whirlpool ram's horn snail are the drying out of river arms because of river regulation works, but also because of siltation and lowering of the groundwater level. In Austria, populations of Anisus vorticulus had been found in Vorarlberg, Northern Tyrol, Lower Austria and the Northern Burgenland in the 60s (Klemm, 1960), but it is assumed that those populations have disappeared in the meantime. 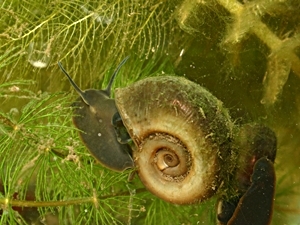 In recent time, the little whirlpool ram's horn snail could be found in Eastern Carinthia (Turnersee, Kleinsee and Sonnegger See lakes) in 2005, as well as in the Salzburg area in 2007. Populations known from the Donauauen national park near Vienna are assumed to be extinct since between 1991 and 2006. The last known populations from near Bad Deutsch Altenburg in Lower Austria were present until 2006. As river regulation measure were planned, the species could have disappeared there as well in the meantime. Today, Anisus vorticulus is still known from the March alluvial valley in Lower Austria, as well as from Carinthia. Animalbase: Anisus vorticulus species homepage. Suffolk Wildlife Trust: Little whirlpool ram's horn snail (Anisus vorticulus). Willing, M.J.; Killeen, I.J. 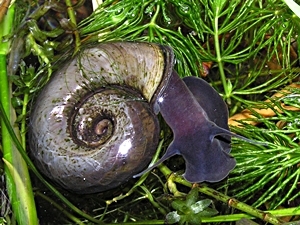 (1999): "A rare and threatened water snail". British Wildlife. Glöer, P.; Groh, K. (2007): A contribution to the biology and ecology of the threatened species Anisus vorticulus (Troschel, 1834) (Gastropoda: Pulmonata: Planorbidae). Mollusca 25 (1) 2007 (PDF). Great ram's horn snail (Planorbarius corneus). Dimensions: Height: 9 - 12 mm; Width: 20 - 34 mm; Whorls: 5. The great ram's horn snail has a very large and thick walled shell with 5 whorls increasing fast. The whorls are characteristically rounded and have a deep groove between each other. There is no keel. The shell has a brownish colour and often a hammered surface structure. Great ram's horn snails can be found in stagnant waters rich in vegetation in depths of up to 3 m, also in waters periodically drying out. The original distribution area of the great ram's horn snail extends over all of Europe and West Asia in a discontinuous way. The species has often been introduced by man and been artificially settled with water plants. In the North German lowlands the species is very common, in the low mountain ranges it is absent and in South Germany it only appears here and there. This American relative of the native European ram's horn snails has become quite famous among aquarium keepers because of low-pigment forms, which are rose coloured because of the blood haemoglobin content. Externally the species resembles Planorbarius corneus, but is smaller. In Planorbella the whorls increase fast as well, but in contrary to the rather smooth whorls in Planorbarius corneus they show thick growth wrinkles, while younger shells are smoother. Besides, the mantle shows large pigment spots shining through. From their original home in Florida the American ram's horn snail has been widely distributed by human introduction. Apart from Botanical gardens and shops specialized in water plants, it mainly appears where the water temperature is agreeable to its needs, such as in Austrian thermal waters (Baden near Vienna, Villach thermal baths in Carinthia) and on Malta. The distribution obviously mostly happens due to aquarium owners setting snails free in native waters. But because of the temperature, Planorbella not always survives outside. on one side of the whorl. Picture: Aiwok. Source: Wikipedia. The keeled ram's horn snails are different from other ram's horn snails in having a sharply edged outer whorl, referred to as a keel, which may be more are less distinctly set off against the rest of the shell wall. In Planorbis carinatus this keel is in the middle of the whorl (contrary to Planorbis planorbis, where it is clearly on one side). The whorls are increasing fast, also different from Planorbis planorbis. The shell mouth is oblique and at the top it is rounded and protruding. Dimensions: Height: 2 - 3 mm; Width: 14 - 17 mm; Whorls: 4,5 - 5,25. The keeled ram's horn snail lives in stagnant and slowly flowing waters in altitudes of up to 1000 m MSL, but prefers water rich in oxygen and only rarely waters periodically drying out, other than Planorbis planorbis. The species mainly also appears in the remains of glacial water bodies. There are dwarf forms living in the pools in the littoral zone of the actual water body. Planorbis carinatus is distributed through all of Europe with the exception of the south of Mediterranean peninsulas. The distribution area of the species stretches from Central Italy and the Peloponnesus as far north as Sweden and Finland to 63° n. L.
Fresh water snails part 2: The ram's horn snail (Planorbarius corneus).